Article 96 (1) of our constitution says- subject to the other provisions of this article, a Judge shall hold office until he attains the age of [sixty-five] years. The Jatiya Sangsad has just amended this section of the constitution, and raised the retirement age of the Supreme Court judges by 2 years. If we summarise the arguments of the treasury bench from whatever we have learnt from the media reports, we will find that apparently a growing need of competent and experienced judges in higher judiciary has motivated to focus on this age issue. The government wants to make sure that the higher court has sufficient number of skilled and efficient judges. Supreme Court Judges indeed perform very vital duties, like, explaining the constitution, guiding issues related to human rights, and revising cases against the lower court verdicts. In fact, the Judges themselves have been trying to raise their retiring ages for a while. The bureaucrats of the executive branch have been trying hard to raise their retirement age to 60 years from 57 years for about 2 decades, and no government ever cared about it. Each government opted to contract out bureaucrats they like and trust, rather than extend the overall retirement age for all of them. 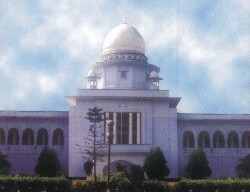 We have been observing the superior court judges after retiring at 65 have been engaging themselves in numerous quasi and pseudo-judicial employments (e.g., Press Council, Election Commission, Court of Settlement, Administrative Appellate Tribunal, Law Commission, Judicial Administration Training Institute, etc.). By giving them an opportunity of working in the judiciary for 2 more years, the nation will be benefited from their valuable expertise. If the need is real, and the judges demand it, then the government's compliance is definitely admirable. Unfortunately, the mistrust among the public and the political parties about government's covert motive is so high in our country that it is hard to believe that a government does anything without any concealed cause. Now, why is the need of experienced judges become so acute in our higher judiciary? The Law Minister has cited specific examples that twenty five Supreme Court judges - 19 of High Court and 6 of Appellate Division are set to retire in next four years. He is concerned that judges having less than 10 years of experience in the Appellate Division and High Court will work at important benches. What has led to this likelihood that there will be so many untried judges in the higher judiciary in near future? How can we make sure that we have adequate number of qualified sitting judges in our higher judiciary? Political malice and whim has played a key role in creating such a situation. The previous government appointed 40 additional judges, nine of whom were confirmed during its tenure. That left confirmation of 31 others, who could not complete their 2 years probation period, in the hands of the later government. This government being suspicious of those appointee's previous political perhaps 0identity and ideology, and eager to recruit judges allied closely to its own political philosophy declined to confirm services of 15 of the judges. It is known from different sources that the then Chief Justices recommended confirmation for most of these judges. If these judges were absorbed, they would have gained already 3-4 years of experience by this time. The current government has also given new appointments to 26 additional judges. If this government can run its full tenure, these judges will possibly be absorbed; but from the third year of its term, any new recruits will have analogous destiny like those 15 judges, if a different government takes over in next election. A vacuum will recur, and we will again be scared of having an acute shortage of learned judges. It can be rationally anticipated that a judge should work no less than 15 years at the High Court Division before going up to the Appellate Division, and a continuous work experience of at least 18-20 years can train one best for qualifying to be the Chief Justice -- the judicial head of a country of 140 million people. It is observed in the higher judiciary, that most of the new recruits start in their early or mid 50s. If a judge is recruited when he is 52 years, if everything goes well, he will be confirmed at 54, and if he is expected to serve there for 12/13 years, he will have almost no possibility to get to the Appellate Division. We have recently observed a fairly good number of judges hold the position of the Chief Justice for about or less than 1 year. Before they have an opportunity to understand the duties and responsibilities of the position, formulate agendas and means for the development of the judicial system, and in so doing offer good leadership, it becomes time for them to retire. A practice to appoint judges at an earlier age (e.g., late 40s) can ensure that we get seasoned judges at the High Court Division, Appellate Division, and that we benefit by a Chief Justice, who can serve longer and better. The inexperience quandary is more widespread when the new recruits happen to be practising lawyers. The jobs of a lawyer and a judge are indeed very different in respect to duties, responsibilities, public relations, and compensation (salary and benefits). When a District Judge is elevated to the higher judiciary, he brings with him extensive working experiences in various capacities (Assistant Judge, Sub Judge, and Additional District Judge) in the lower judiciary. He, also, has the least possibility of allegiance to any political structure. Whereas, for a lawyer, it takes time to get used to act and behave like a judge overnight. Regrettably, it is because of their non-alignment to formed political philosophies, the proportion of District Judge to lawyers is getting smaller in every batch of appointments at our higher judiciary. If we analyse the two recent recruitment, government's uninterest to choose District Judges become obvious. In August of 2003, the government appointed five additional judges at the Supreme Court. In this lot, only one was a career district judge. The rest belonged to the Bar. Another set of recruitment in April last year only two were District Judges. It is evident that only 20% places at the higher judiciary are occupied by internal judicial service promotions. The discrimination against the district judges in promoting to the Supreme Court frustrates the judicial cadre service holders as their career potentials shrink terrifically. Their agony multiplies as whenever the senior members of the lower judiciary can make it to the higher judiciary, they almost reach their retiring ages by then. Thus, from the High Court Division, unsurprisingly, they can never go up the ladder to the Appellate Division, forget about ever contending for the position of the Chief Justice. It is imperative that the top judge of the country should have a solid understanding and a firm grasp over the functionalities and intricacies of the lower judiciary including the magistracy. A veteran District Judge is plainly barred to go high under the existing system. Political considerations and discriminations of the government are prevailing in appointment and confirmation of judges to the highest judiciary, as the process is not transparent and not clearly prescribed by law. Getting over with political whim and malice, appointing judges at a younger age, confirming efficient judges (with Chief Justice's recommendation), and raising the ratio of district judges in recruitment can help in ensuring transparency, and create trust in higher judiciary recruitment. Hasanat Alamgir is a Doctoral Candidate at the University of British Columbia, Vancouver. (C) Copyright The Daily Star.